Whether you recently purchased a home in Perinton or you are just in town for a few days, there are many places to go and things to see. From the Erie Canal to Powder Mills Park where you can view the wetlands, you do not have time to stay cooped up due to a toothache. Fortunately, there are many options for dental providers in Perinton and you will be able to find the exact provider you need. At emergencydentistsusa.com, we want you to have the information you need at your fingertips. We have compiled a list of all dental providers in the local area that are accepting new patients. All you have to do is look at the list and determine which dentist you want to visit. If you are running short on time, do not panic and take a moment to call our toll-free dentist finder hotline. Our team will assist you in locating a dentist. Our team members are trained to help you quickly find a dentist who can meet your needs. Once you have found a dentist you think you want to visit, our representatives will schedule your appointment for you. We do recommend that you bring a valid form of identification with you, a list of your current allergies and medications, your insurance card, and copayment for service. If you are in need of a dentist in Perinton, you will be happy to hear that there are options available to you. For example, you will be able to visit any orthodontist, endodontist, periodontist, or general dentist in the area and receive the care you need. If you do have a toothache, you will likely visit a general dentist first. If the general dentist cannot help you, you will be referred to a specialist who can. Description: Fairport Family Dental is ready to serve you and provide you with the care and quality dental services you need. Our team is dedicated to making sure that your experience is the best it can be. We offer a wide range of dental services to include cleanings, periodontal treatment, restoration, and maxillofacial surgical procedures. Description: At Perinton Dental Group, we are here to help you. We want you to be able to smile in the mirror and like what you see. We provide all of our patients with quality care in a comfortable, safe, and welcoming atmosphere. You will find that our office is equipped with the latest in dental technology. No matter what your dental needs are, we are here for you. Description: CrossKeys Dental provides quality dental services to your entire family. We base all of our dental care on trust and compassion in an environment where you feel safe and comfortable to tell us your concerns. Whether you are in need of a routine procedure or you think you have a dental emergency, we are here to help you. Tooth pain can be the first indication that there is a serious problem and it needs to be handled right away to prevent further issues with your tooth. If you do not handle tooth pain right away, you may develop an infection or find yourself in serious pain. If you have been in pain for two or more hours, you should seek out dental care from an emergency dentist. If you have been involved in an accident and you have tooth or jaw pain as a result, you may want to visit the ER first to rule out any serious conditions. 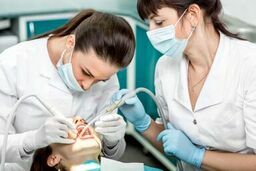 Before you visit any new dentist, you should view the dentist’s credentials and make sure that they are licensed to provide the services you need. To do this, you should visit the New York Dental Association website and perform a search of the dentist’s name.